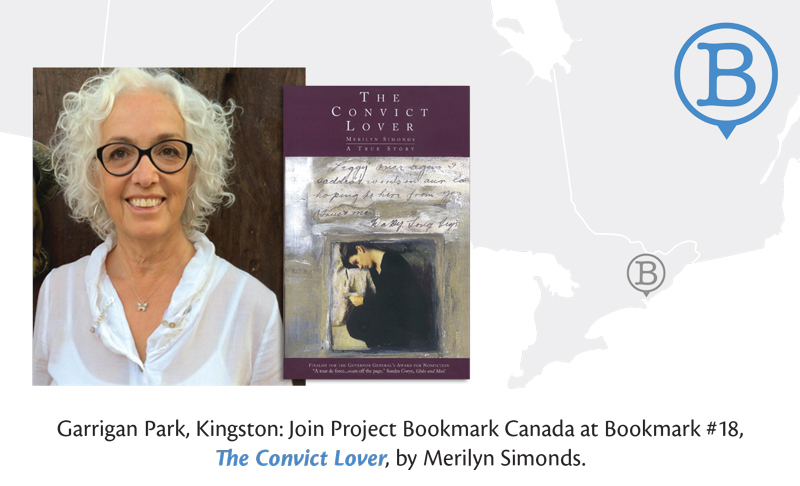 On September 30, Project Bookmark Canada will unveil a plaque to celebrate The Convict Lover and its place in the Canadian literary landscape. The plaque will be installed in Portsmouth’s Garrigan Park, once the quarry where Kingston Penitentiary convicts did hard time. This is the 18th Project Bookmark Canada plaque, and the 2nd for Kingston, the first being “Mexican Sunsets,” a poem by Bronwen Wallace. beside Domino Theatre in Portsmouth village. In addition to speakers, singer Chris Hugh Brown, Founder of Pros and Cons, will perform “The Prisoner's Song." Juicy Kik food truck will be on site, 10:30 a.m. – 12:30 p.m.
At 12:15 p.m., following the unveiling, Merilyn Simonds, author of The Convict Lover, will lead a “Prisoner’s Walk” from the quarry through the village to the penitentiary, with readings from the book. Kingston WritersFest, City of Kingston and the Ontario Trillium Foundation for their support.